Dear EarthTalk: What’s the story with LED light bulbs that are reputed to be even more energy-efficient than compact fluorescents? Perhaps the ultimate “alternative to the alternative,” the LED (light-emitting diode) light bulb may well dethrone the compact fluorescent (CFL) as king of the green lighting choices. But it has a way to go yet in terms of both affordability and brightness. LEDs have been used widely for decades in other applications-forming the numbers on digital clocks, lighting up watches and cell phones and, when used in clusters, illuminating traffic lights and forming the images on large outdoor television screens. Until recently LED lighting has been impractical to use for most other everyday applications because it is built around costly semiconductor technology. But the price of semiconductor materials has dropped in recent years, opening the door for some exciting changes in energy-efficient, green friendly lighting options. According to HowStuffWorks.com, LED bulbs are lit solely by the movement of electrons. Unlike incandescents, they have no filament that will burn out; and unlike CFLs, they contain no mercury or other toxic substances. Proponents say LEDs can last some 60 times longer than incandescents and 10 times longer than CFLs. And unlike incandescents, which generate a lot of waste heat, LEDs don’t get especially hot and use a much higher percentage of electricity for directly generating light. But as with early CFLs, LED bulbs are not known for their brightness. According to a January 2008 article in Science Daily, “Because of their structure and material, much of the light in standard LEDs becomes trapped, reducing the brightness of the light and making them unsuitable as the main lighting source in the home.” LED makers get around this problem in some applications by clustering many small LED bulbs together in a single casing to concentrate the light emitted. But such LED “bulbs” still don’t generate light much brighter than a 35-watt incandescent, much too little light for reading or other focused tasks. If LEDs are going to replace incandescents and CFLs, manufacturers will have to make them brighter. EarthLED is lighting the way with its EvoLux and ZetaLux bulbs, which use multiple LEDs in a single casing to generate light. 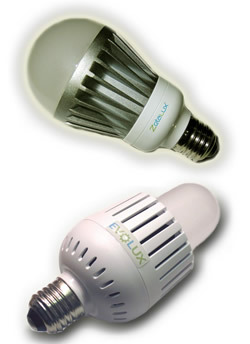 The EvoLux delivers light equal to that of a 100-watt incandescent, the company says. But the $80/bulb price tag may be tough to swallow. The ZetaLux, which retails for $49.99, delivers light equivalent to a 50- or 60-watt incandescent, will last 50,000 hours and costs only $2/yearly to run. Other bulb makers are working on similar designs for high-powered LED bulbs, hoping that an increase in availability will help spur demand, which will in turn lower prices across the board. Until then, consumers can find LED bulbs suitable for secondary and mood lighting purposes in many hardware and big box stores. C. Crane’s 1.3-watt LED bulb, for example, generates as much light as a 15-watt incandescent bulb. Check your local hardware store for other options, as well as online vendors such as Best Home LED Lighting, Bulbster, SuperBrightLEDs.com and We Love LEDs. CONTACTS: How Stuff Works; EarthLED; Best Home LED Lighting; Bulbster; SuperBrightLEDs.com; We Love LEDs. Dear EarthTalk: Used motor oil is a big contributor to the pollution in our waterways and drinking water. How can I make sure I am not contributing to this problem? 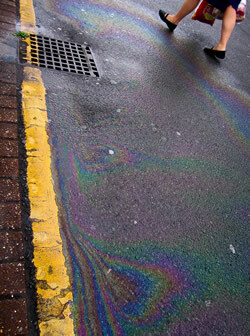 Motor oil leaked from individual vehicles—or outright dumped by homeowners and commercial garages—constitutes a significant chunk of storm water runoff, the fallen precipitation that runs off of roads and parking lots and inevitably finds its way into local water bodies. These pollutants include not only leaked motor oil—which may contain toxic substances like lead, benzene, zinc or magnesium—but also fertilizers, insecticides, plastic debris, cigarette butts, paints, solvents, sediments and other hazardous waste. Topsoil and natural vegetation would ordinarily filter many of these pollutants out, but the impermeable pavement that covers much of the surface where these pollutants originate carries it right into storm drains and into streams, rivers, lakes and the ocean where it can poison marine life—which we might eat—as well as entire riparian or coastal ecosystems. This pollution also finds its way into underground aquifers that supply our drinking water, so reducing it is a human health measure and could also save municipalities millions of dollars a year in drinking water treatment facilities and operational expenses. While government agencies try to craft and implement development and zoning standards to help reduce storm water runoff problems caused by commercial and industrial entities, there is still much that individuals can do to reduce their impact as well. Indeed, upwards of 40 percent of oil pollution in the U.S. comes from the improper disposal of used motor oil by individuals. The U.S. Environmental Protection Agency (EPA) recommends keeping on top of automotive maintenance to prevent and repair leaks, and disposing of used motor oil and other automotive fluids and batteries at designated drop-offs or recycling locations (consult Earth911.org to find one near you). Also, it is preferable to wash your car at a commercial car wash instead of in your driveway. By law, car washes must treat their wastewater before disposing of it. Besides handling and discarding your motor oil and other automotive fluids responsibly, cutting back on or eliminating fertilizers and pesticides from your lawn or garden will also reduce your negative impact. Also, don’t over-water your lawn, as that can create extra run-off as well. And if you are embarking on a residential landscaping project, try to incorporate permeable pavement (which allows run-off through it into the soils below) as well as rain barrels to collect water, and rain gardens, grassy swales and driveway-side vegetative strips—all planted with region-appropriate native plants of course—to help filter contaminants out before they hit the storm sewers. Taking these small everyday steps may seem like a hassle, but the benefits for the environment and human health are immeasurable. CONTACTS: U.S. Environmental Protection Agency; Earth911. GOT AN ENVIRONMENTAL QUESTION? Send it to: EarthTalk, c/o E/The Environmental Magazine, P.O. Box 5098, Westport, CT 06881; submit it at: www.emagazine.com/earthtalk/thisweek/, or e-mail: earthtalk[at]emagazine.com. Read past columns at: www.emagazine.com/earthtalk/archives.php. We are pleased to get to know that you are specialist in the field of LED Lighting industry. As a professional manufacturer and exporter for LED Lighting product in China,we sincerely hope to establish business relations with your esteemed corporation in 2010! LED technology is always keep fast pace in recently a few years, as the lighting of the future, it has been replacing all traditional lighting devices at present. Our focus is to provide you a wide range selection of LED lighting solutions for your any projects or help your business development well! Some of our items maybe are suitable for your business: such as LED Fluorescent lamps,LED high power spotlight,LED strips,LED rope light,LED Module,etc. Please visit our website at http://www.tx-led.com/ for more details about our full range of products, then let me know which models you are interested so that we can send you exact information. Look forward to discussing further details with you soon. Thanks! Led Light Manufacturers– led lighting manufacturers in India .Gkon offers you best led light manufacturing and provide electrical switch accessories, led light, fixtures, VPIT Ballast, MCB’s, distribution. boards, AC boxes, plugs sockets, wire and cables etc. Led Light Manufacturers- led lighting manufacturers in India .Gkon offers you best led light manufacturing and provide electrical switch accessories, led light, fixtures, VPIT Ballast, MCB’s, distribution. boards, AC boxes, plugs sockets, wire and cables etc. Commercial Led Lighting– leading commercial led lighting manufacturer in india and providing quality Commercial Led Lighting, outdoor commercial led lighting, commercial led exterior lighting. We are manufacturer of Led Strip and a variety of led lights. Tri-State LED Lighting Wholesale has the most detailed and comprehensive listing of LED light bulbs, LED tube lights, LED High Bays, LED Street Lights, LED Strip Lighting and LED lighting retrofit solutions anywhere. All types and styles available at low wholesale prices. T5, T8, T12 compact fluorescent lighting (CFL) replacement in a variety of color temperatures including Warm White 2700-3200k, Natural White 4000-4500k, Day White 5500-6000k and Cool White 6500-7000k.